Is your child learning how to play the guitar? Do they want to emulate their rock heroes with an electric guitar, instead of an acoustic? If so, you could go all out and buy them a custom Dean USA for around four grand… Or you could be more sensible and opt for an affordable guitar specifically for kids, which retains Dean’s classic rock-fueled style and sound at a price that everyone can appreciate. This is why we’re reviewing the Playmate Evo J – the child-friendly electric guitar in Dean’s entry-level Evo series. The Playmate Evo J (also known as the Mini) is cut from the same cloth as the full-size Evo XM, with a soft and curvy Les Paul-esque single-cutaway body shape. However the Mini is a 3/4 scale version, with a petite 18.75” scale length which is easier for children, and even adults with small hands. 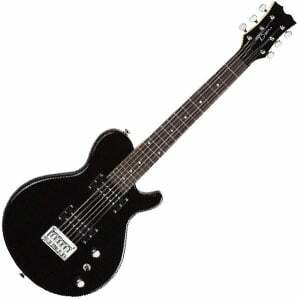 The body is made from solid basswood and finished in a menacing glossy black, with a bolt-on neck. This neck is made from maple and features a comfortable C shape, a rosewood fretboard and 22 medium jumbo frets, with pearloid dot inlays. Very simple in design, but works well as a starter guitar, offering good playability and a sturdy feeling, even in this budget price range. 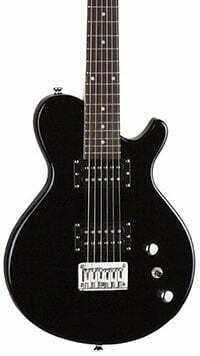 Forget single-coils, this model comes loaded with two DMT-designed humbuckers at the neck and bridge positions. These are controlled by two simple chrome dome knobs – one for master volume and a master tone control – as well as a three-way toggle to switch between the pickups. The headstock bears the familiar Dean signature logo as well as a set of sealed die-cast chrome tuners in a 3+3 configuration. Just below this is a plastic nut, while the other end of the guitar sees a classic tune-o-matic bridge. Finally, the guitar comes strung with a set of good quality light D’Addario EXL120 strings. None of these components are premium in any shape or form, but for a guitar that costs around $100, they don’t perform badly. With a good body and two humbuckers, it should be apparent that the Playmate Evo J is not a toy guitar and actually has a solid little sound. For clean practice it offers a clear sound. Add some overdrive and you can dial in everything from gritty blues crunch right up to a heavy rock distortion, although the exact tone and thickness you get will depend on the quality of your amp (bear in mind that this guitar does not come with an amp). With the stock pickups – although decent – it’s not really worthy of performance, but it is perfectly tailored for practice and even jamming with friends. For the measly asking price, the Dean Playmate Evo J is a serious contender for those on a budget. Whether buying a child their first guitar for Christmas or an upgrade from a basic classical guitar, this model is one to add to your shortlist – with a cool rock attitude, decent sound and small hand-friendly playability. 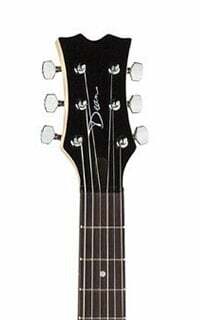 For more info about the Dean Playmate Evo J, click here.